This is the Sirius bass, it shares some similarities with the Sirius guitar such as the body and headstock shape but there are a lot of features on the example pictured here that bass players will love! 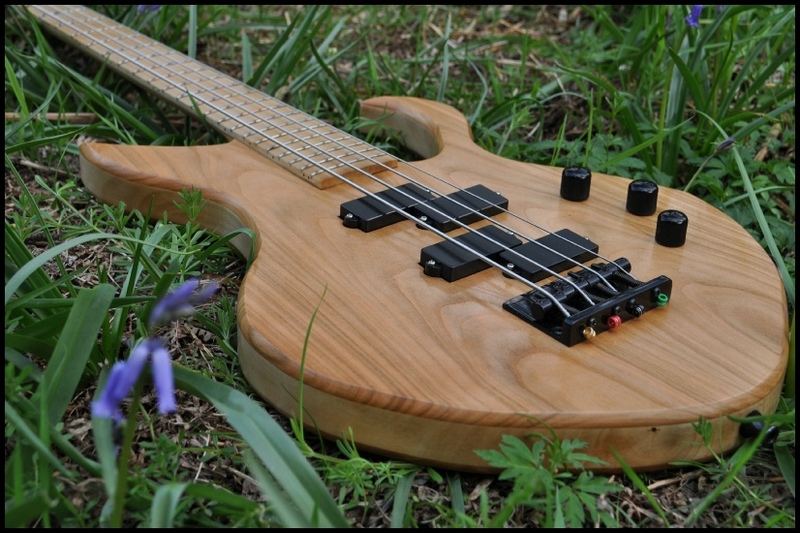 Features such as two split Kent Armstrong precision pickups, one in the usual Precision sweet spot for the classic P bass tone and one at the bridge which together make a wide range of tones available. The medium scale length (32") and extra slim 3 piece Cherry and English Maple neck make playing very comfortable for long sessions. Both body and neck are constructed from all native timber grown and felled in Devon. The body has a bookmatched Cherry top and back with English Maple core. The neck is a 3 piece featuring the same woods with again an English Maple fingerboard. So there are only a total of 2 species of timber throughout the whole bass...this is no accident! We believe using these two woods has created a lovely harmonious look. We ran with this theme, creating a truss rod cover and control cavity lid with the same woods, though dyed black for some contrast and to match the Gotoh hardware. This whole instrument has a natural feel and look to it so we decided on a thin satin finish which not only looks great but feels fantastic, almost like playing on unfinished wood!